Well, the piece of railway track I told you about yesterday has been extricated from the lawn and moved, single handed, to the back patio until I can work out how and when I can get it out of the garden and transported to the new house. It came in with six persons carrying and dragging it on its side, so I suppose it will have to go out in the same manner if I can summon enough energy and find enough conscripted volunteers. The alternative is to cut it into smaller pieces which would be an option to consider. 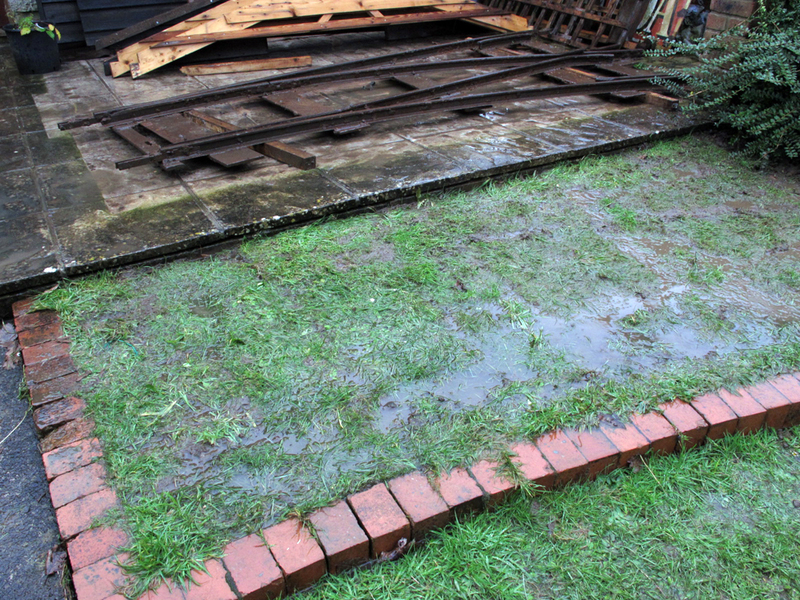 After levering the rail onto the back patio, in the pouring rain I might add, I decided to replace the turf whilst it was so wet and then puddle it in. As I was stomping about in the mud a silly childhood memory came back to me, of when I became stuck in stodgy deep mud and had to be extricated by my mother. This incident happened in about 1956 near the entrance to Moorlands Road in Heronstone Lane. 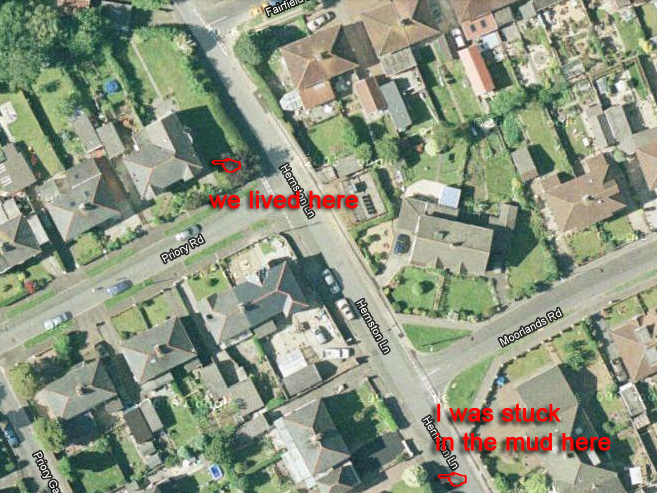 Now anyone who is reading this and knows the intersection I’ve just mentioned will wonder how I became stuck in mud as clearly this is a built-up residential street with not a muddy patch in sight. At the time, we lived in the corner house on Priory Road, a quiet little side street on the outskirts of Bridgend, with Heronstone Lane running alongside our house. The lane had houses on one side only and on the other was a large field behind a hedge and grass bank. The surface of the lane was very poor and with no pavements there were often puddles in the verges. Then the builders moved in to the field opposite and started digging huge holes and bringing in large lorries, dumper trucks, bulldozers and all manner of equipment for creating a new street. Inevitably the lane, which was pot-holed and puddled anyway, became a quagmire in parts and we weren’t allowed out there unless we wore our wellington boots. In those days we could play in the lane quite safely as there was little or no traffic, the fastest vehicle that used the lane was Johnny Griffiths the milkman’s horse and trap – I kid you not! My friend and I, as seven-year-olds, were obviously attracted to the mud and puddles and paddled quite happily in them, but there were one or two that were very glutinous and in one of these I became trapped. My paddling companion was useless, he just ran off laughing and I was left yelling “Mum” until she heard and came to my rescue, prising me out of the mud minus one wellington and sitting me on the wall before giving her attention to my other boot. I can still hear the sucking noise it made as she pulled it out of the mire!